Arrival in Chur or St. Moritz by train 2nd class from the Swiss border or any Swiss airport. Overnight in Chur or St. Moritz. Today you travel with the Bernina Express of the Rhaetian Railway along the UNESCO World Heritage route. Enjoy an Alpine switchback ride, taking you from the high, towering glaciers of the mountains down to the swaying palms of Italy: the Bernina Express is the highest railway line across the Alps, linking Northern and Southern Europe – and in the most spectacular way! Overnight in Lugano. The Bernina Express tour package ends with a return to Swiss border or airport or continue your vacation in Switzerland at your own request. 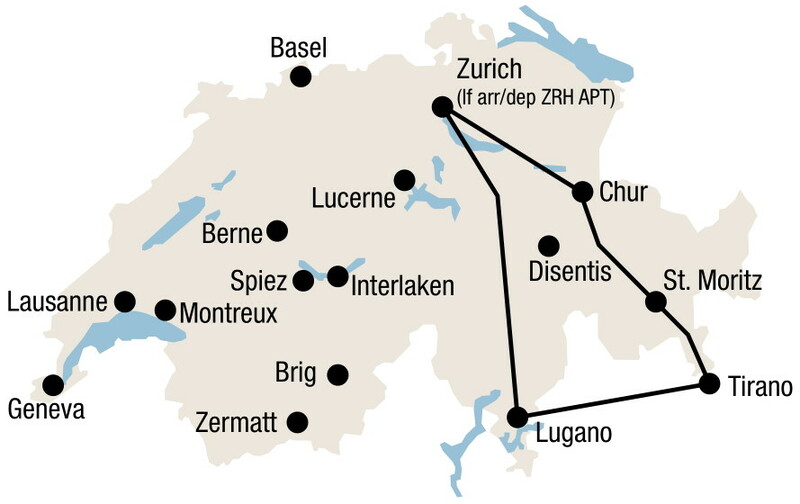 Swiss Transfer Ticket Combi: Bernina Express (3 transfers) in 2nd class from/to Swiss border or airport. Seat reservation for Bernina Express (coach and train). 1 night in Chur or St. Moritz, standard room with private facilities, breakfast. 1 night in Lugano, standard room with private facilities, breakfast. Can be added to your vacation packages in Switzerland any additional tickets for optional excursions to travel by rail, boat, postal-coach and cable car can be purchased at 25 – 50% of the regular fares. The journey leads through the Valtellina, which is famous for its fine wines. The route offers a magnificent blend of nature and culture. You travel along the shores of lake Como and lake Lugano back into Switzerland. Lugano is the cultural heart of the Ticino region and a very popular tourist destination.